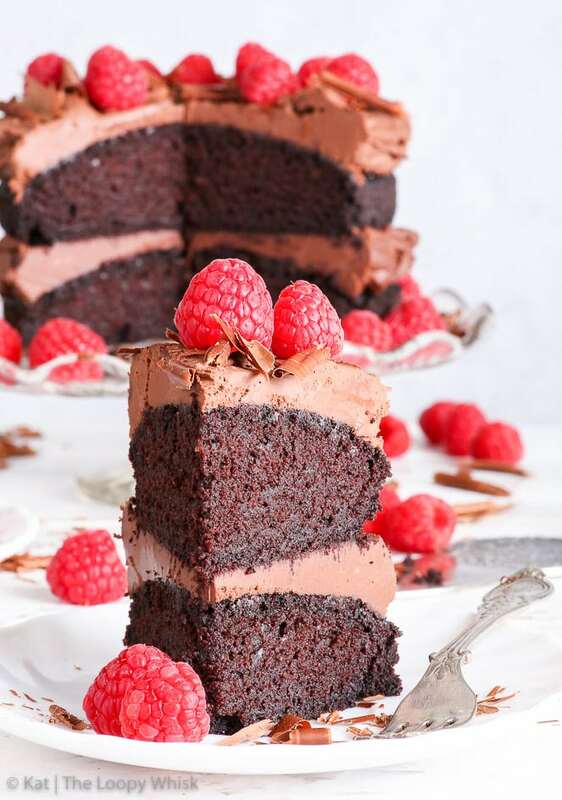 This gluten free vegan chocolate cake will blow you away – with how it looks, how it tastes and how incredibly easy it is to prepare. No fuss, no weird fancy ingredients, only an hour of your time… and you’ve got yourself a decadent, gorgeous gluten free vegan cake. And the best thing: nobody could possibly guess that it contains no gluten, no eggs, no butter and no milk. Yes, it’s that good. 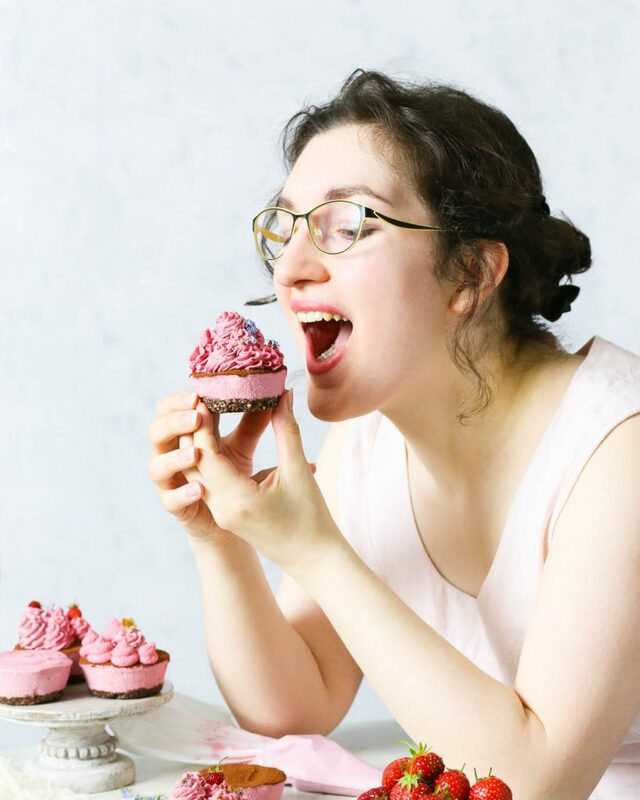 When it comes to vegan and/or gluten free baking, there’s this persistent belief that it’s the most complicated, difficult thing on the planet – borderline rocket science. The thing is: people like to complicate… pretty much everything… pretty much all the time. (And please note that this is coming from the – self-proclaimed – queen of over-complicating things.) Yes, baking without gluten, eggs, butter and milk can be daunting. But once you step over that initial hurdle (that’s only in your head anyway), it’s a piece of cake. Really. Really really. Pinky promise. So let’s jump into it, shall we? Because we’re totally badass and nothing scares us (not even egg-less baking) – and because CHOCOLATE IS THE BEST THING EVER, we’ll start with a *drumroll* gluten free vegan chocolate cake. Deep breaths now. We got this. You got this. Mmkay? Just look how pretty it is. So pretty. Now, you might think a vegan chocolate cake recipe will be difficult to master. 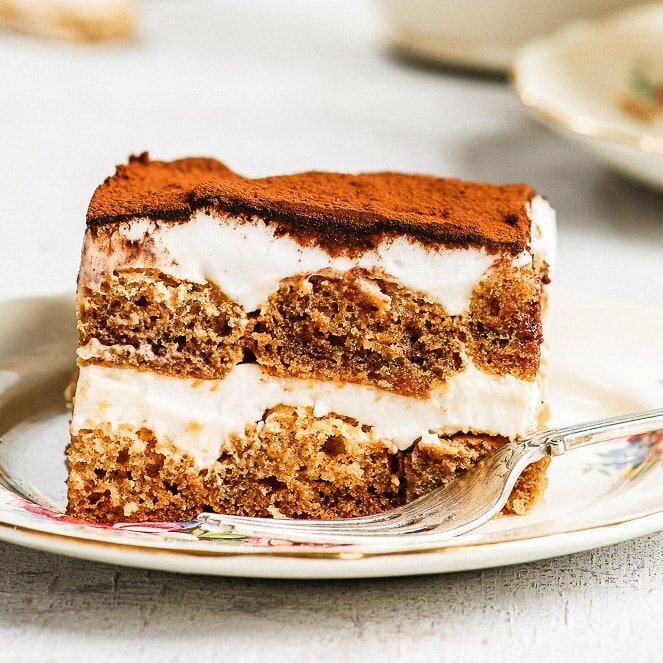 There’s no egg to hold things together and to give the cake it’s lift, no gluten to prevent the cake from going crumbly, no butter to keep it rich and moist… It’s okay, I thought so to. Initially. But then, I remembered that quirky recipe that’s been around since the WWII: the wacky cake. 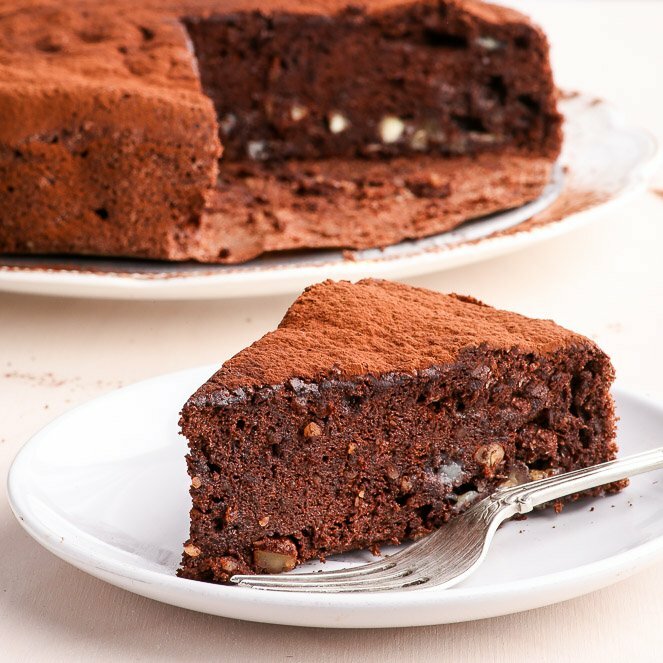 You see, due to the shortage of just about everything during WWII, clever people have come up with a chocolate cake recipe that contains no eggs and no dairy. Does this ring a bell? I didn’t follow a specific wacky cake recipe or anything similar. (Simply because I really don’t like following recipes. Go figure. And I have a food blog. With recipes. Don’t try to understand, I know I don’t.) I just threw the ingredients together in a way that felt right (<— yep, 100% accurate scientific procedure right there) and the cake that came out of the oven was… perfect. It also has the prefect balance between being dense and fluffy – I know that may sound contradictory, but it’s so true. It has the fluffiness of a good sponge, so that when you press it with your finger it has that bounce of a perfect sponge. 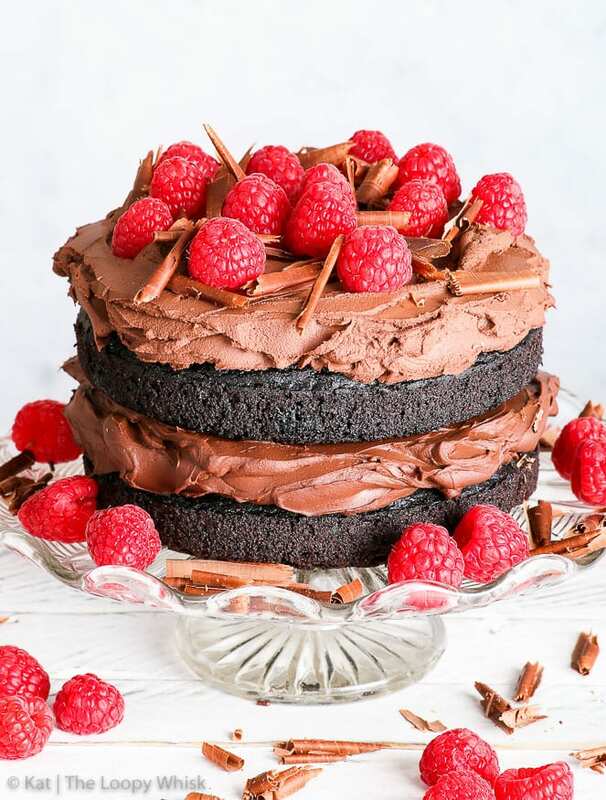 But like any good chocolate cake, it’s not too dry or airy – because everyone knows a good chocolate cake is moist and has a certain weight to it. Does that make sense? Tell me it makes sense. The vegan chocolate frosting is another example where simplicity and effectiveness go hand in hand. Two ingredients, little to no fuss, and you’ve got yourself some amazing chocolate frosting. Coconut cream and melted chocolate. That’s all you need. Now, you’ll notice that the instructions for making the vegan chocolate frosting are a bit… odd. But there’s a reason for that. Because we’re essentially making a “naked cake” with very generous amounts of frosting, I wanted a chocolate frosting that has the airy body/volume of a whipped buttercream and the smooth texture of a chocolate ganache. So what I did is make a super concentrated ganache, by pouring a relatively small amount of boiling hot coconut cream over a whole lot of chocolate. This makes an intense, very dark ganache, that may appear slightly grainy (depending on the water content of your coconut cream). That’s okay though. No stress. Then, I mixed the chocolate ganache gradually into more coconut cream. Which is weird, I know. But it works. It really really works. I mean… just look at it. It’s all silky and velvety and just… gorgeous. Have I convinced you yet? That gluten free and/or vegan baking can be (and is) simple? I suppose the ultimate proof is in making and eating (obviously) the cake. 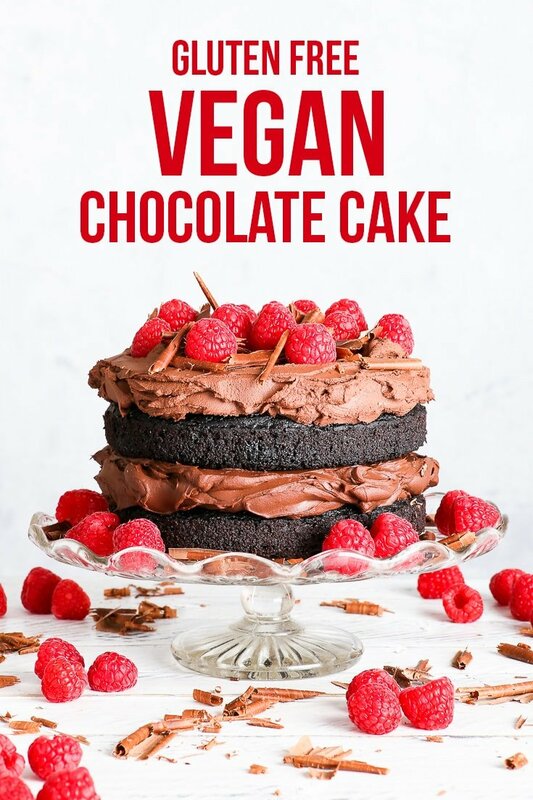 All I can say is that this vegan chocolate cake recipe is probably one of the easiest on TLW, and when I brought the cake with me to work, people were impressed both with how it looked and how it tasted. Nobody could tell that it’s gluten free and vegan. Nobody could tell it took only about an hour to make. What they saw and tasted was an amazing chocolate cake that delivered on all fronts. What more could you possible want? Pre-heat the oven to 355 ºF (180 ºC) and grease two 6 inch (15 cm) round cake tins with vegetable oil. You can also line the bottoms with greaseproof/baking paper. Mix the wet ingredients together, and add them to the dry ingredients. Stir well, until you get a smooth cake batter. Divide the batter evenly between the two greased cake tins, smooth out the tops, and bake in the pre-heated oven at 355 ºF (180 ºC) for about 40 minutes or until the tops are springy/bouncy to the touch and an inserted toothpick comes out clean. In a saucepan, heat 1/2 cup of the coconut cream until boiling hot. Place the chopped dark chocolate in a heat-proof bowl, and pour over the boiling hot coconut cream. Allow to sit for 5 minutes, then stir it well until you get a glossy, dark, intense chocolate ganache. Allow to cool until only slightly warm. In a separate bowl, place the other 1/2 cup of coconut cream. This should be at room temperature or only very slightly cold. Slowly (a tablespoon at a time), stir the chocolate ganache into the coconut cream. 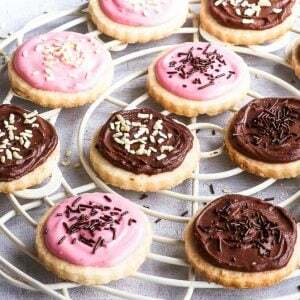 At the end, you should be left with a smooth, easily spreadable frosting ideal for decorating. Layer the sponges together with the frosting, like in the pictures above. 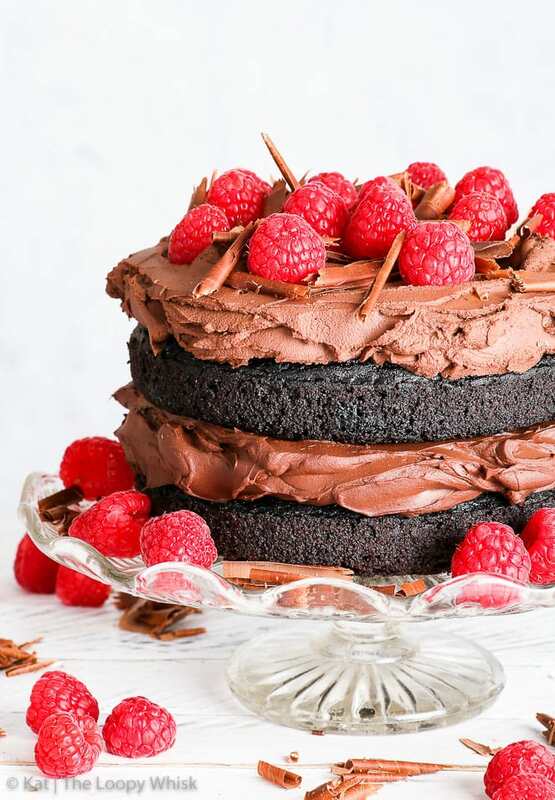 NOTE: Be sure to work relatively quickly – use the frosting as soon as possible after preparing it, as it tends to firm up slightly on standing, which makes it difficult to spread. 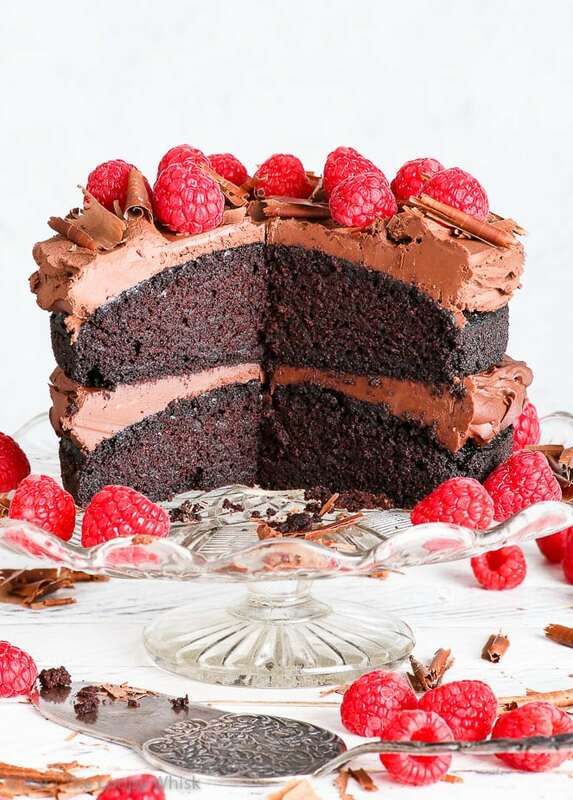 Decorate with raspberries and chocolate shavings, or other decorations of choice. The gluten free vegan chocolate cake keeps well in a closed container in a cool dry place (the fridge is fine, too) for 3 - 4 days. Looking for more sweet vegan goodness? You’ve come to the right place! This cake! I will 110% be making this for valentines day! The crumb looks fudgy and moist and the frosting looks so fluffy and decadent! Do you have any experience with how this cake freezes? I was hoping to make 2 layers a week before I needed it, and freeze it until the day before. Hi Jamie, I haven’t tried freezing the cake. I would try it once (with only 1 layer) as a trial run before you actually need it. I’m pretty certain it should be OK, but better safe than sorry. Is it self raising flour or plain flour you used.? Thankyou. Is this recipe only suited to 6inch tins? What non dairy milk do you use? If almond milk was used, wluld ypu use sweetened or unsweetened? what milk do you use? I mostly use almond milk, as I don’t have any sensitivities to nuts, but pretty much any non-dairy milk should work. I recommend using the unsweetened variety, as it allows you better control over how sweet your cake will be. Could you make this with regular flour if the xanthan gum wasn’t added?? What blend of gluten free flour do you use? Hi Michelle! I usually stick to the simpler gluten free flour blends – the one I’m currently using only contains rice, potato and maize flour, with no added xanthan gum (it a blend from Lidl, in UK). I prefer to add my own xanthan, as it gives more control over how the bake turns out. Do you have a favorite gluten free flour? I’m new to this scene and am spending lots of $ trying to find what’s best for baking. Hi Donna! I usually stick to the simpler gluten free flour blends – the one I’m currently using only contains rice, potato and maize flour, with no added xanthan gum (it a blend from Lidl, in UK). I prefer to add my own xanthan, as it gives more control over how the bake turns out. Can I use guar gum instead of xanthgum. Hi Kesha! In general, xanthan gum is better for baked goods (here’s a good article on this topic). But if you do decide to give guar gum a try, let me know how it goes! Hi there wondering what oil you use? Would coconut work? I used sunflower oil but it tasted a bit oil, would coconut oil be nicer? Made this cake. It came out about 1/2 inch high(each one) and the icing looked nothing like the one in the photo! Did you use a mixer to make yours or just double the mixture? I’m pretty good at making cakes and can usually get a good result but sorry, not this time! I daresay it will taste okay if it does ever stay together (can’t get the icing to thicken either). And yes, I did use just coconut cream and no fluid. Thanks. Hi Lyn, terribly sorry you’re having problems with the recipe. I didn’t use a mixer and I’ve used the same amount as stated in the recipe. What size baking tins are you using? I’ve used 6 inch ones, which are rather small. Also, check whether your baking powder and baking soda are past their expiry date, they lose they activity over time. As for the frosting, I know that some coconut creams contain many stabilisers, and once you’ve mixed them with other ingredients they become super runny. Maybe try refrigerating it, and see if it thickens. Or try whipping it longer with a mixer, sometimes it helps. 🙂 Hope this helped, and let me know if you have any other questions! Just to let those know who were interested- I froze this cake and defrosted it the day before I iced it and it was honestly even better than the first time round! Perfect recipe to do in advance, very very impressed. I do think you have to double the recipe to get a proper sized cake though, I did 4 x the recipe for a full 9 inch cake! Thank you so much for letting me know, Amy! I don’t tend to freeze my bakes, so such information is always appreciated 🙂 I did make my cake rather small (6 inch), but I think it scales nicely. Super happy you enjoyed it! Hey Amy! Really glad you like the cake 🙂 It should definitely work with coconut sugar – and if you give it a try, let me know how it goes. Hello I was wondering if this recipe can be interchanged from vegan and vegan/gluten-free just with the flour? If so does that mean that if I were to use all purpose flour as a cheaper alternative would I need the anthem gum? I’m pretty sure it should work. Let me know how it turns out! It looks amazing! It can be so hard with so many allergies.. I’m also allergic to rice and nut free.. What flour can I substitute the “gluten free” mix? Coconut? Buckwheat? Quinoa? Thanks! Hi Zoe! I feel you with the allergies’.. I typically use a shop-bought GF flour blend, which consists of rice, potato and maize flour. I haven’t experimented with other flours, but I think buckwheat flour should work. *fingers crossed* I would first try it on a smaller quantity (for instance just one cake layer) and then scale up. If you can eat eggs/aren’t vegan, I recommend my paleo chocolate cake. Hope this helps! This looks AMAZING. It can be a real challenge with so many allergies..
What would you suggest? Coconut? Buckwheat? I noticed you used coconut flour for you Paleo Cake? If I have a gf flour blend with xantham gum in it…. in theory I just omit the xantham gum from the recipe, correct? It doesn’t need “extra” to work, right? Also, for the frosting, I’m sensitive to coconut. Is there a substitute for the coconut cream I can use? Could I use regular dairy whipping cream? I mostly needed a gf/egg free recipe. Or if there is another non-dairy substitute I’d love to try it! Hi Jen! If your GF flour already contains xanthan, you can omit it from the recipe. As for the frosting, you can definitely use the dairy whipping cream – I’ve used the coconut cream because I wanted to keep the recipe vegan, plus I love the flavour. 🙂 If you’re sensitive to coconut, just use dairy cream. Yay!!!! A vegan recipe for cake which actually works every time you make it, and which the non-vegans enjoy as much as the one vegan in the family! Thank you so much! Birthday cake problem solved forever. Ohmygosh Sal I’m SO GLAD you and your family enjoyed the recipe! Your comment totally made my day! I made this cake today and it turned out amazing! I used my own homemade gluten-free flour, and as for the milk of choice I chose almond milk. I’ll be icing the cake using my vanilla icing recipe that we’ve had in my family for years. Since I’m the only gluten-free member in my family, I’ll have it all to myself haha! Thanks so much for this recipe! 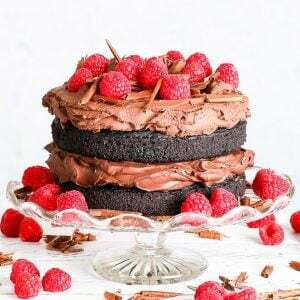 It’s so hard to find easy gluten-free cake recipes and this one is just great! Just made this and its super yummy. Abit thin cos my tins are too big but out tomorrow to get smaller ones haha. Little problem with the frosting though, it came out very runny. Any tips would be very much appreciated. New to this baking fun. I used blue dragon coconut cream, just off the shelf so not cold. Thanks alot. Great recipe! Will make again defo. Hi there, could I use sunflower oil instead of vegetable oil. This cake was delicious! I substituted the caster sugar for coconut sugar and it turned out great! However the frosting turned out quite runny and I couldn’t get it to thicken. I tried whipping it but it made no difference. Do you have any suggestions? It’s definitely a recipe I will make again though! Delicious! This was a hit for my baby’s 1st birthday. Able to accommodate my new dabble into veganism and my sister’s GF diet. Some people thought it was a bit too sweet which is probably due to the can of coconut cream I used. Unfortunately, did not see handy note 2 about coconut milk. I also used dark chocolate chips instead of a chocolate bar. Next time I’d like to try with stevia, as well. As is, this recipe was delicious and easy to make! I’m SO HAPPY to hear that Bonnie! 😀 It’s one of my favourite cakes (ever), so I’m super glad you and your family enjoyed it. What is a heat-proof boil? I’ve Googled without illumination. Would I have to adjust the oven temp, and baking time, or just the baking time if I were to use bigger pans? I am not the greatest at switching up things in recipes, but I currently do not own 6in cake pans. Alternatively if I go buy 6in cake pans, how tall should each layer of cake be approximately? I would be okay just doubling the recipe, and doing 4 layers instead of two. 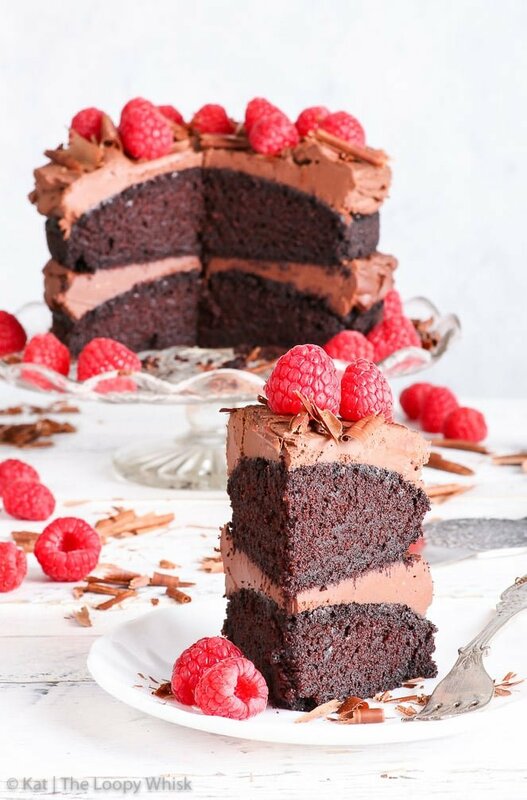 I am basically a mess when it comes to baking, but I want to attempt this cake for my best friend’s birthday since we live in a town that doesn’t have a lot of bakeries, and none of the ones we have will do gluten free/vegan. If you’re using larger pans, keep the oven temp the same, but the baking time will probably change. If you’re using the same quantities of ingredients, the sponges will be thinner and will therefore bake quicker. The 6 inch baking pans I use are the ones from Wilton, about 2 inches tall – these are quite tall sponge layers. The recipe is very flexible in terms of scaling up or down. Hello! I need 9 cups of batter for the bundt pan for my daughter’s wedding. Would tripling this recipe be enough? Thank you! i wonder if the sponge cuts nicely? Could I make one sponge in a bigger tin and cut it in half, or does it crumble and falls apart? It cuts really well – just make sure it’s completely cooled before cutting. Would it be possible to make cupcakes with this recipe? Yes! Check out my Gluten Free Vegan Chocolate Cupcakes. I just made cupcakes and they came out perfect. I did fill closer to top of the liner assuming it would not rise as much and they did get a nice dome but did not overflow. I baked in convection for 30 minutes. This recipe is SENSATIONAL!!!!!! I used a gf blend with equal weights potato starch, tapioca starch, white rice and brown rice flours courtesy of Minimalist Baker. I used coconut sugar which i ground down to make it like castor sugar and i used coconut oil and coconut milk. Fabulous and simple!! I baked the cakes in 8 inch diameter pans and they rose beautifully. This just became my new total favourite chocolate cake recipe. Thank you for your brilliant work!!!! This was really good and properly crumbly, in the way you want a chocolate cake to be – you would never guess it’s both vegan and gluten free. I used Fava bean (broad bean) flour because the legume grows in the UK where I am. I would imagine chickpea/gram flour would work really well too, though both might taste too strong for a non-chocolate version of the cake. Ermmmm this cake came out mad oily. 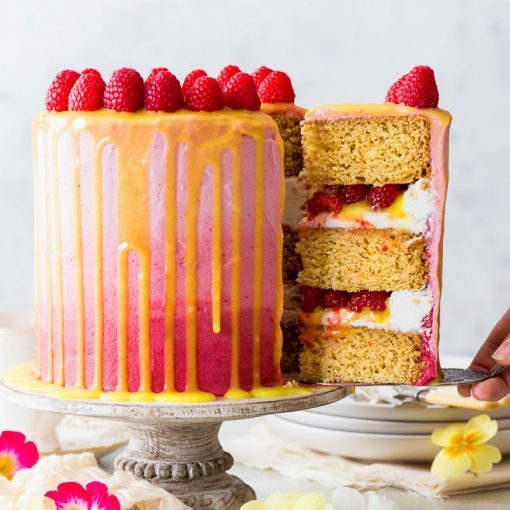 I really wanted to like it and yours looks so beautiful but sorry 240ml oil is waaaaay oily…I had residue on my hands when I touched the cake to see how springy it was. ….wow. Hi Ella! Sorry to hear you’ve had trouble with the recipe. I’ve made this cake many times and it never came out oily (as have many others). 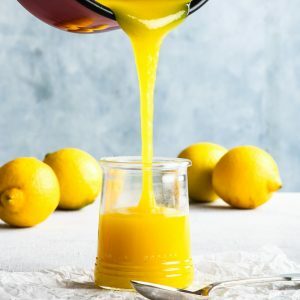 What kind of oil/fat did you use? That could have an effect. 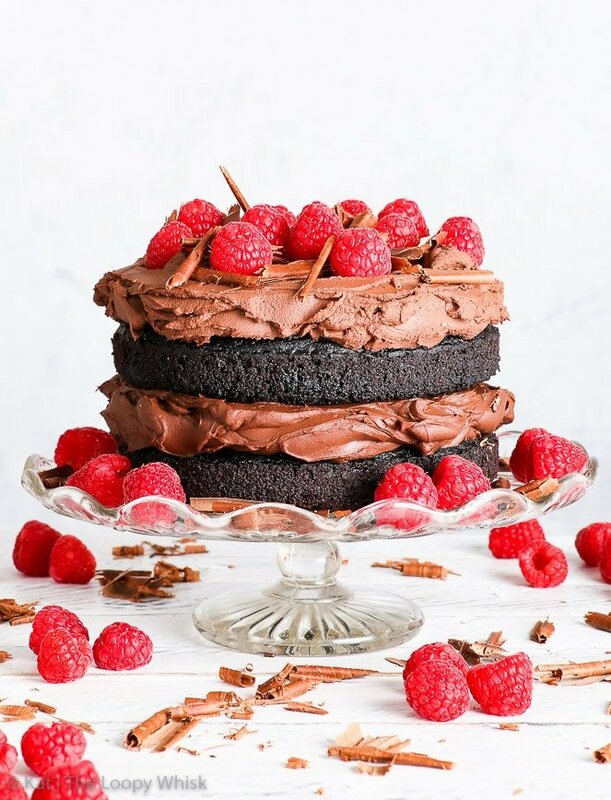 I came across your site in my search for a nearly perfect true chocolate gluten free/vegan cake. 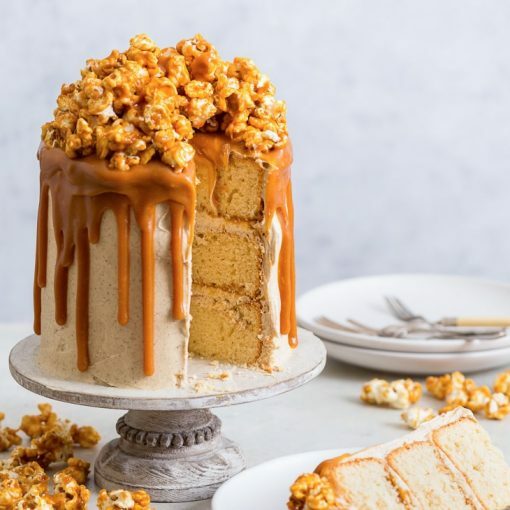 I have 2 points on this recipe to make….I’m a professional baker but have very little experience in making a cake that is truly allergy free. I’ve made vegan and I’ve made GF, but never the 2 in one. I must say I’m IMPRESSED. I expected the more dense crumb associated with GF cakes. 1. What I got was an AMAZING soft crumb very much like a wheat flour cake. It was not dry at all. I did use HALF applesauce and half light OLIVE oil (soy allergy) to reduce the oily flavor. For the milk I used and unsweetened vanilla almond milk (what I had in my fridge). The cake was super spongy and everything I would desire. HOWEVER… 2. it really lacked flavor. I was hoping the cocoa powder would mask the GF flour taste (homemade- tested perfectly for cakes only) I did not get that truly chocolate flavor I was looking for. It was very mild. My question is… how can I increase the chocolate flavor without losing that perfect crumb and still keeping it vegan by not adding melted chocolate? Thanks for this great base recipe!! Hi Carmen! I’m so glad you’ve enjoyed the recipe! 🙂 Regarding your 2nd point: many high cocoa percentage chocolates are vegan (and they give more flavour than milk chocolate anyway) so I would add some melted chocolate into the batter. Furthermore, you can increase the amount of salt slightly – that should bring out the flavour. Finally, some coffee (instant, powder or brewed) can also enhance the chocolate flavour. Hope this helps! Glad you like the recipe, Alessandra! Followed the recipe exactly but made cupcakes instead. Perfect cake texture, but the ganache is really runny – any tips? I’ve already tried to melt down and add more chocolate but it’s now room temperature and still the consistency of thick milkshake! I was hoping to pipe it onto the cupcakes! Glad you like the cupcake, Ashely! 🙂 Regarding the frosting: it’s possible your coconut cream contained too much water, which made it runny. Make sure to use a high coconut percentage coconut milk, leave it in the fridge overnight and then use the coconut cream (on top) that separates out. So glad you like the recipe, Fiona! 🙂 Regarding the frosting: it’s possible your coconut cream contained too much water, which made it runny. Make sure to use a high coconut percentage coconut milk, leave it in the fridge overnight and then use the coconut cream (on top) that separates out. COuld you make this in a 9×13 pan or does it need to be the two round pans? You can definitely make it in a 9×13 pan, but you might need to adjust the baking time slightly. I have a DF + GF chocolate cake recipe that uses ground almond in place of any fine flour; however it’s not eggless. Have you tried using ground nuts in place of the GF flour? Hi Beth, I don’t think ground almonds (or almond flour) will work well in this recipe – the texture will probably be more brownie-like and not a light as you would want a cake to be. 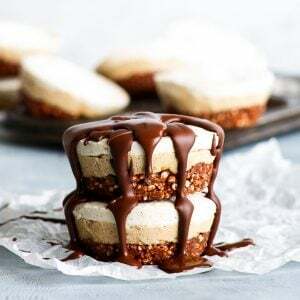 Just wondering if you can make this nice icing in advance and how would you store it? Hi Angela, I find that the frosting is best made on the day. However, making it a day in advance and keeping it in the fridge should be fine, just bring it to room temperature before using it, so it can be easily spread or piped. Also is it okay to pipe, or do you need to beat it? You can definitely pipe it as is, but if you want it to be fluffier, you can beat it a stand/hand mixer. can I replace all of the oil with applesauce? I’ve made this cake twice now & using different oil & different milk. I’m reading all these great reviews & I’m just unsure what I’m doing wrong. The cake turns out well looks great, had a good texture & it’s nice & moist. It had a really strange taste though & I / we just cannot eat it. Could it be the flour making it taste this way? Are you by any chance using a GF flour mix that already contains raising agents? If that’s the case, then the total amount of baking powder and baking soda could be too much, giving the cake an unpleasant aftertaste.